Yes, we do some things very well. Oh dear! What is the tax rate on wages for example? What! But I have a leaflet here from HMRC. It does not mention anything like that! No, it is heavily disguised. Right. But first we had better be clear what we are talking about. Well, here is a tin of beans, it costs one pound before tax.They then add 20% VAT. So the tax rate is expressed as a percentage of the cost before tax. Seems straightforward. What are you leading to? When I say our tax rate on wages is 100%, I mean the taxes are 100% of what is left after tax is deducted. OK, I get that. But how does it tie up with this leaflet? We start with the cost to the employer, then take off all the taxes paid on that cost, until we get left with what the worker actually enjoys. We find that all the taxes are as much as what he actually enjoys. So that is a tax rate of 100%. So you mean that 50% of Employers’ costs of wages goes in taxation? Yes, but from the point of view of the wage earner, as in the tin of beans, the rate on what is left for him to live on is 100%. Right, I get it. But why do they do it that way? That is a tricky question. What it comes down to, is that the people of this country prefer this system, rather than using the natural provision for government expenditure, which is expressed as location alues, created by all for the use of all. How odd! But I suppose if I’m going to live here, I had better understand the details. Here is a set of tables………………………….. 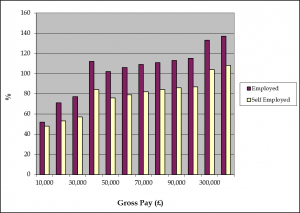 The numbers at the foot are the total salaries negotiated when you take on a job. The employer has to pay more than that because he has to pay a surcharge called National Insurance of 13.8%. The mauve columns show the rate of tax applied to the remainder that the worker actually enjoys, after Income Tax, more National Insurance, and Indirect Taxes included in his purchases. The yellow columns are the result of the same calculations for Self-Employed persons, who pay lower rates of National Insurance. However, remember they are responsible for their own Pension contributions. The Indirect taxes included are derived from Government Statistics which show that the lower paid pay a higher proportion of their take home pay than do the higher paid, thus reversing some of the effects of lower Income tax rates. The tax rates and detailed calculations are on the attached sheets. 1. A sharp distinction of the view of wages from the points of view of employees and employers. 5. 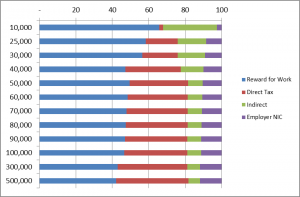 The effect of taxation at the margin, leading to more tax required to mitigate the effects. Well, it seems a funny way to do things. But I read that you give some of the taxes back? Yes we do. They are called tax credits. And the rules for getting back some of the tax you have paid are even more complicated than the rules for paying it in the first place. Low paid people get more back than they have paid! That must have some odd effects? Yes, indeed. Here is a chart of average wages;- so, we know that average wages came down, and rents increased, when tax credits were brought in. The total tax credits became a huge drain on the Treasury, but did not affect our charts very much. We can still say the tax on wages is 100%! 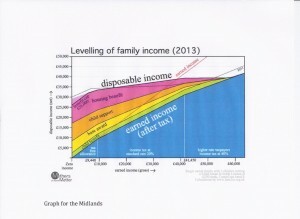 And here is a chart showing how tax credits impact on lower incomes. (Produced by “Mothers at Home Matter) The thin red line is the original Gross Income then the blue area is the income after Income Tax Indirect taxes would reduce the blue area still further. Well, perhaps in spite of all that, I’ll still come to live here, Can I get a house easily? Oh yes! You can get a house built for £60,000 upwards, and an old house can be very cheap. But there is a snag. You remember those location values I was talking about? Well, because they were not collected for public use, they became site values. So a decent site near to London, for example, might cost you upwards of one million pounds. Oh dear! Maybe I’ll go and live somewhere else. Again there is a snag. At one time, this country had a huge empire, and we exported both our good practices and the failure to collect location value for public purposes to all the empire, and these countries still do that. So your choice is rather limited. Well, thank you. I think I’ll say goodbye now!